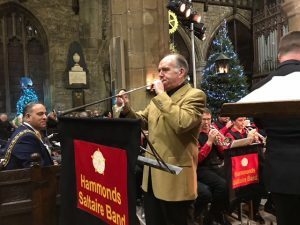 I have just returned home from Halifax, having been at the Minster on Sunday morning to accompany the Choir and Congregation in the 10.30 Morning Service. The Choristers gave a truly beautiful account of that magical Basque Carol Gabriel’s Message under Canon Barber’s inspirational direction. The singing on Saturday looked as well as sounded very good and everyone had worked with substantial commitment at the afternoon rehearsal. 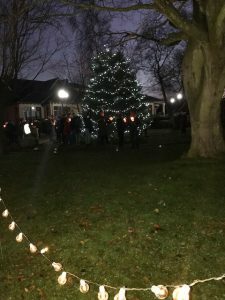 By the time evening came, there was a further tranche of real involvement with the diction and some splendidly confident singing. I do congratulate you most heartily on the great success that the evening most certainly was. 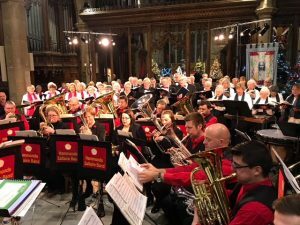 The Band, Phillip and Alan all added their own particular magic to that success, of course, along with Morgan at the helm of the brass and solo items. Warm thanks go to the Committee for their sterling endeavours in so many areas – not least among them the excellent figures in respect of ticket sales. It was extremely generous of you to give me such a handsome gift and I will treasure the lovely card with all your signatures on it. Particularly poignant, of course, are the absence of three greatly loved key names in our Choir history – Dorothy Woodhead, Sylvia Graucob and Nigel Trenholme – all taken from us so very recently. We remember particularly their families at friends at this time. I “christened” the briefcase to great effect on Monday this week in Sheffield City Centre for which purposed it housed my carols with the Bach Choir of that city. So this special message comes to you all with every possible good wish to you and yours for Christmas and the year ahead and it’s onwards and upwards now to the choral music for the Hymnsing and for a rip-roaring account of Sullivan’s wonderful music for The Pirates of Penzance! 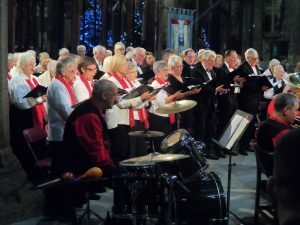 Please see below for a selection of photos from the concert on Saturday evening in The Minster. Many thanks to David Armitage and Nick Thomas for these. Feedback from the concert seems to have been very complimentary – here’s hoping we raised a good sum for Overgate. Our next rehearsal is on Wednesday 17th January when we will begin preparation for the Hymn Sing. Best wishes for the festive season to you all. 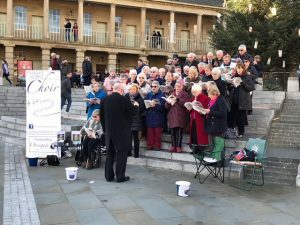 Many thanks to everyone who sang at The Piece Hall and /or The Light up a Life Service on Sunday. Both events were appreciated by those who attended and both benefited the Hospice – in different ways. £203 was collected in the buckets at The Piece Hall.